Android is one of the widely used Mobile OS across hand held devices like smart phones and tablets. DART is involved in Android application development services from the time when official Android SDK was launched. 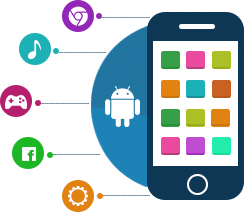 We at DART have a specialized team of Android experts who are highly skilled and possess experience in all the update to date feature of Android SDK required to develop Android mobile apps. DART is a well known Android app development company providing professional and cost effective Android app development services. Our team of Android developers have experience in handling all kinds of Android mobile apps from small to complex data driven mobile apps. By utilizing the latest tools and up to date technologies, our Android app experts deliver the below services. In order to provide professional, optimized and cost effective solutions to our customers. Our Android experts have knowledge and expertise in all the available technologies . This give us variety of options to provide proper solution to our customers. We chose the technology based on requirement and that will add value to the customer on money, time and app performance basis. Finally, Why DART? Below are the key points to support our services which have been satisfying our clients so far. DART has a dedicated expert team of Android developers who have in-depth and up to date knowledge in all the required technologies. We chose development framework and architecture based on the clients requirement. We believe in one app deployed across devices so that it can minimize cost and time. Our Android experts have in-depth knowledge in Android SDKs, Google Play Services, In-app billing APIs, 3rd Party payment gateway integration like PayPal, Google Checkout. Got a Android app requirement or idea, Contact Us to have a discussion.